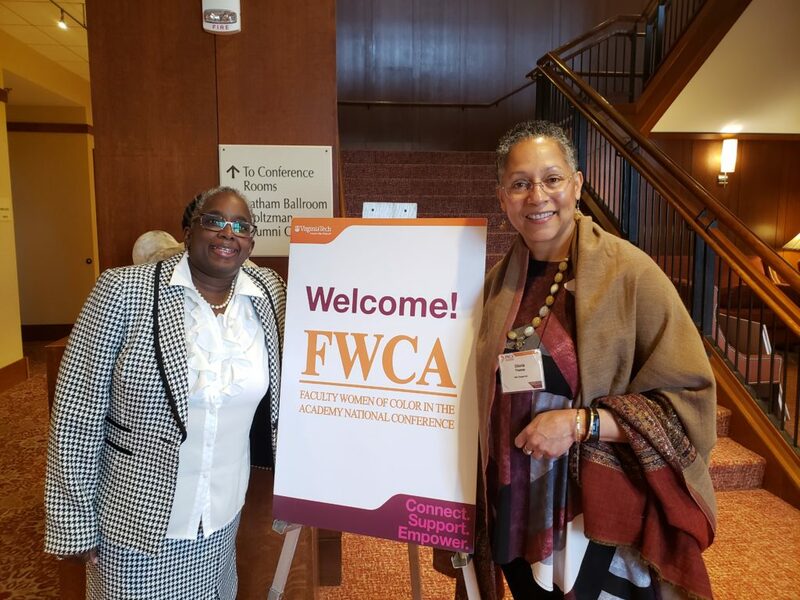 I am just catching my breath from an amazing conference – The Faculty Women of Color in the Academy (FWCA) at Virginia Tech. I started this conference 7 years ago at the University of Illinois at Urbana-Champaign. When you birth a baby, you can only hope it is happy, healthy, and growing. And this baby is…and I’m a proud mama. 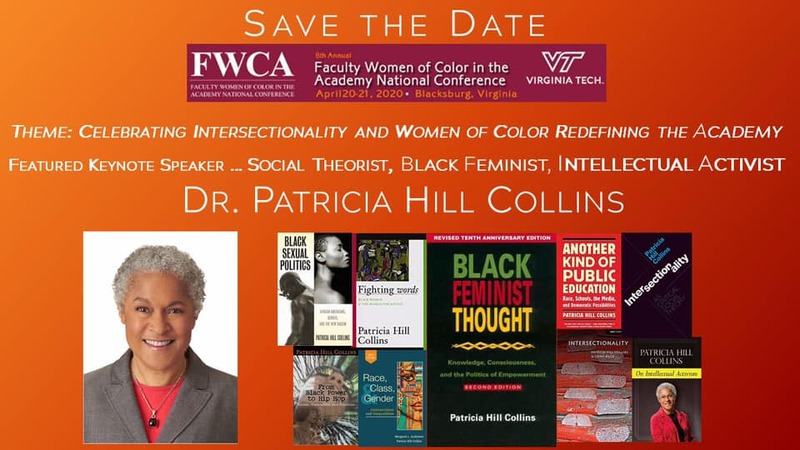 This conference was envisioned as a unique and sacred space for women of color in the academy. A place for being renewed, reminded, reinvigorated; an opportunity to recommit and to be reminded why we started down this path in the first place; why our presence matters; why we must keep on, even when the road is blocked; even when we feel despised; even when we are dejected; even when we feel alone; even when we are the only. 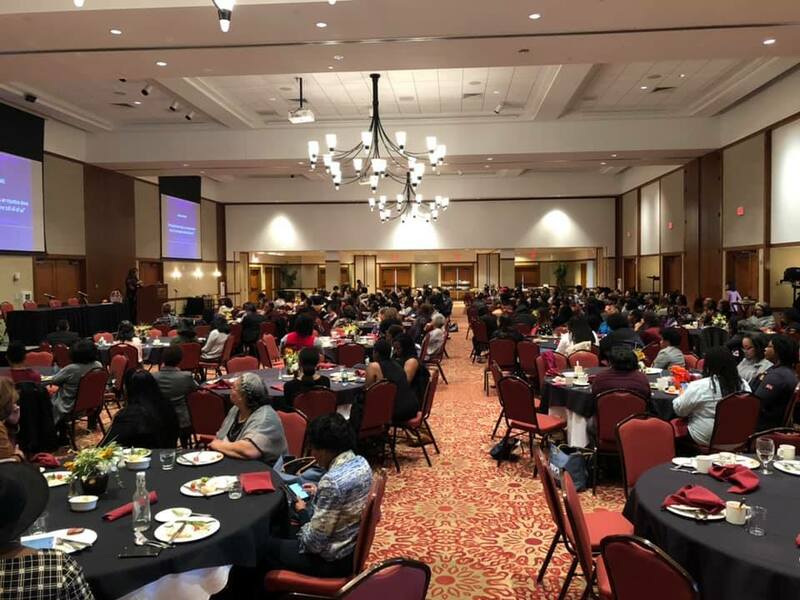 This weekend, I met so many women of color who are not only the only woman of color in their department; they are sometimes the only woman of color in the college; and sometimes the only faculty woman of color at their institution. Imagine the isolation, the loneliness, the aloneness. And so, for seven years, I have watched women of color walk into the conference and I have felt that — the thatness and heaviness of being alone; of struggling without mentors; of walking blindly, but trying to project a confidence and conviction of belonging; of trying to justify being. I have felt the pain and the tears of years of the struggle: a struggle that often began as a student – sometimes an elementary student – shunned by a teacher; sometimes a middle school student – the only one; sometimes a high school student that the guidance counselor never counsels to go to college, if there is a guidance counselor, and not a police officer/safety counselor. I have felt the struggle that continues in college classes when no one selects you to be in the small group, or you are always chosen last; when you don’t get picked because of the stereotypes and assumptions about whether you belong. I have seen the graduations, when women of color, finally graduating, but being too exhausted from the days and months of oppression to even celebrate when their name is called and they walk across the stage, knowing deep down that though one journey ended, another is just beginning. our best dressed selves feeling scorned and scrutinized, we finally get the offer. The offer to work — in administration, or academic spaces as faculty – comes. We are excited, grateful, but also worn out from rejections, anxiety, not knowing if we were too woman, too dark, too light, too big, too smart, too overqualified — always never quite good enough. We wonder, even as we say yes, whether we got paid the same as the White woman or the White man or man of color also hired. We were too happy to get the offer, too inexperienced to know how to negotiate, to nervous and disempowered to say anything but yes. But we know as the research shows, that we get paid less, with less office space and smaller lab space; with a greater course load, but less professional development dollars; and often no preassigned mentors. We always start with less and have to do so much more. We know it in our souls and spirits and our every day reality. We start with less and have to do so much more. We have had to do so much more already and anyway. The bar is always set higher for women and people of color, for we have to be “qualified” when many of them are not; are just mediocre, but have connections and relationships and social networks we can only dream of; who have had mentors that connected them to the hidden network and knowledge of publications and grants and book contracts, while we spin around in circles, searching hopelessly on Google for guidance, on Twitter for a diamond in the rough tweet about how postdocs are never posted and how to find one; for Facebook groups where we bare our souls somehow thinking it is private, when all is public and there is no such thing as privacy on the internet. Yet in our desperation, we do desperate things. Our networks as women of color are often shallow, a person or two deep. So when we succeed, it is because we have done more; and we are more excellent. The bar was higher and we met it. But not without a cost. And so when we come to FWCA, we wear the cost in our eyes — listless, sometimes glazed, staring, but not focused; we wear it on our backs: drooped and hunched from the weight; and we wear it on our weight—literally bearing pounds reflecting the agony of carrying the loads — as mothers, wives, sisters, sister-friends, daughters, aunts, grandmothers — of the world of color. That is how we come to FWCA. we enter the conference, needing but not knowing what. Needing a word from on high: encouragement, wisdom, confirmation. Confirmation that we matter and that our journey matters. And most importantly, that we are not alone. Some come early, very early. Just to sit in the space; to look and hope expectantly…for something. What we hope for is often not clear, for we often don’t even know what is possible. How we will be treated? How we will feel? What will happen? Many are here for the first time; some have come for many years. All sit and wait. And then, it happens. The shift. The energy changes. And we realize that we can own our identities as women of color in the academy. An army comes forth — hundreds of women of color – black, Asian, Indigenous, Latina, LGBTQ, Muslim. The shift — the energy. We all collectively breath. I have heard it every year. I can feel the collective sigh: the breath held in from years of struggle and apprehension released. I can almost hear the release. I see backs begin to straighten; shoulders begin to stop sagging; eyes beginning to lose the glazed look, and smiles beginning to appear. The women check in. 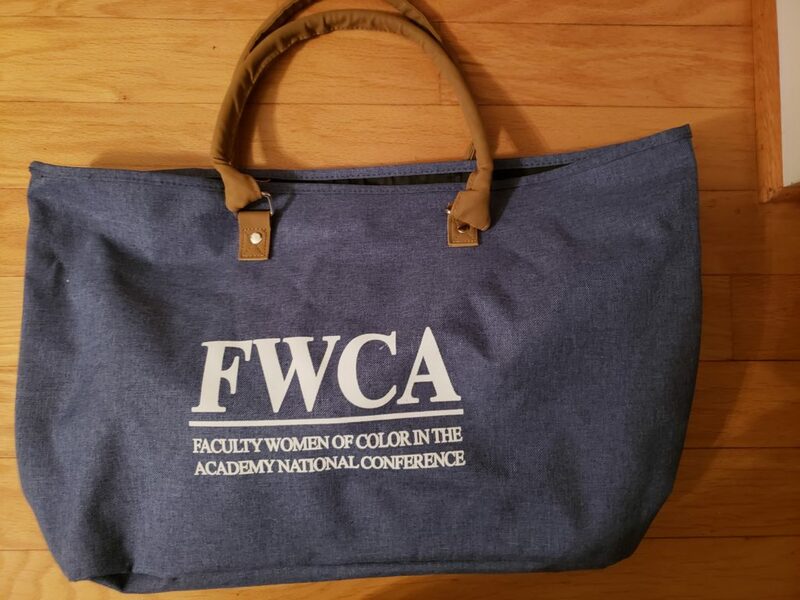 They marvel at the wonderful conference bag…not saggy, not small, not for shopping groceries — for we really do not need a grocery bag to remind us of our double duty as women, mothers, wives, and cooks, and caretakers — but classy and sophisticated. A bag we are proud to carry around; one that says that we are special and that we are valued. 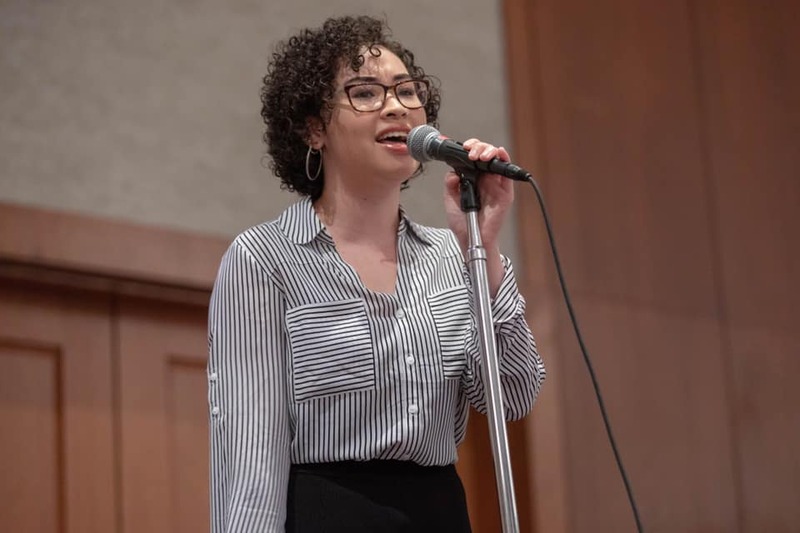 The opening singer — an African-American undergraduate student — in clinical neuroscience — tells us that we are “superwomen” singing. Her mere presence — a statement. The lyrics by Alicia Keys on point. Yes, we come to FWCA claiming, YES, I will, YES I can. Trying to find our strength, coming together, speaking what we are yet to believe. 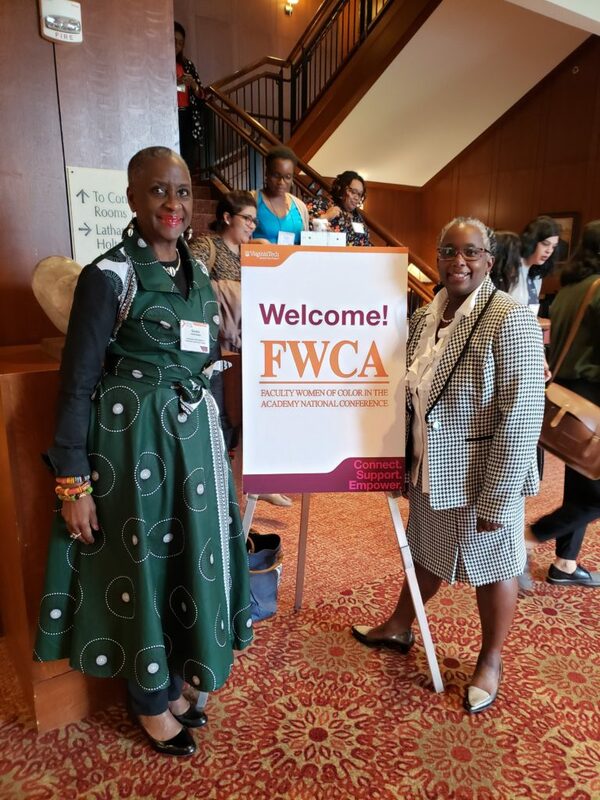 At FWCA, women of color have found a place where they belong; a place to own; a place to sashay — to “walk in an ostentatious yet casual manner, typically with exaggerated movements of the hips and shoulders” as unabashedly, as Naomi Tutu, the opening keynote did. In a remarkable demonstration of the power of action, in the middle of her speech, she backed up from the podiums (podiums created for men that often too tall and barely allow our necks and faces to be seen) she straightened her long gown/dress robe, and walked across and off and around the stage, to let us see that she – an Episcopal priestess – choose consciously not to dress as White male priest, reminding us that God called her to be a priestess, and not a White man, and thus, she did not have to dress, act, be, in their outfits, in their definition. She could be herself – a Black South African woman. She reminded us that something happens when a Black woman walks. In a blog post for Black Women’s History Month, I wrote about what happens when a Black Woman Walks Into a Room. An that is what happened when Naomi Tutu walked into the room. She brought with her ancestors from the continent, channeled through her stories, to remind us of our power and potential. She challenged us to think about our stories – stories that we are told; stories that we tell ourselves about who we are and where we belong. She encouraged us to focus on solidarity — solidarity with one another and care for ourselves. She gave us permission to sleep late, to focus on ourselves. And she reminded us, that while we often feel we need to be nice and even submissive and silent, that especially as women of color in the academy, “sometimes we cannot be nice.” She also challenged us to work on the divide between Africans and African-Americans and to move away from speaking about Africa, as a monolithic place, because it is a continent and to name countries and demonstrate our respect for cultural and historical differences. Most importantly, she challenged us, to be fierce and compassionate at the same time and reminded us that “the work is out there no matter how tired and angry we are.” We must do it and Yes, we can and we will. And, compassionately, she gave us permission to be mediocre, sometimes. We cannot always be excellent and that was important for us to hear. 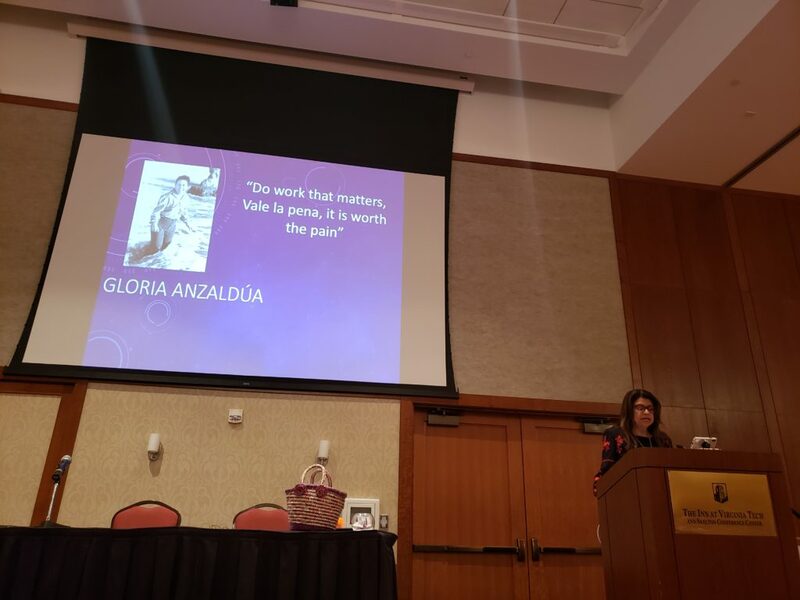 She shared a powerful story of a young Latina college student who was always late, who was in her first class on Latina/Chicana feminism – a class of 100 – that she pulled aside one day and told her to get it together. 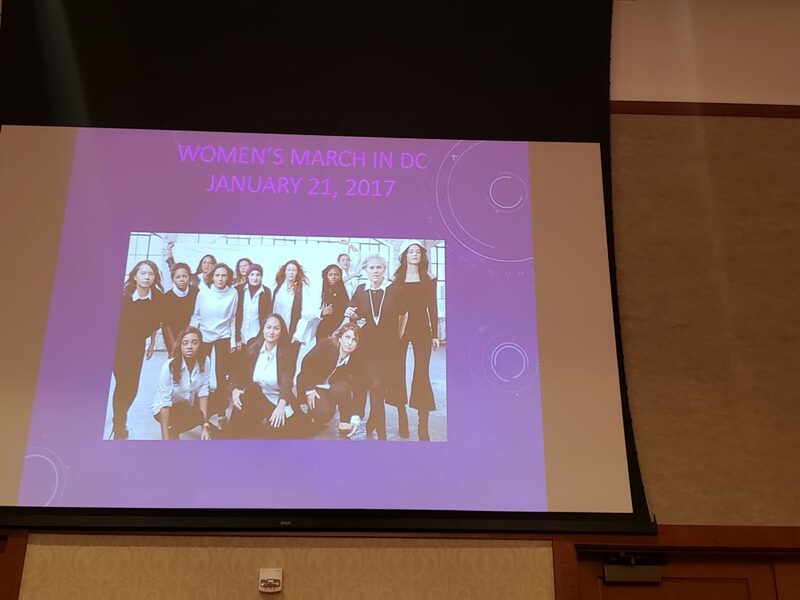 Not knowing for years whether she graduated, got it together or not, she was shocked when that same students, now a grown woman and 40 years old (Carmen Perez), was on the planning committee of the Women’s March of 2017. 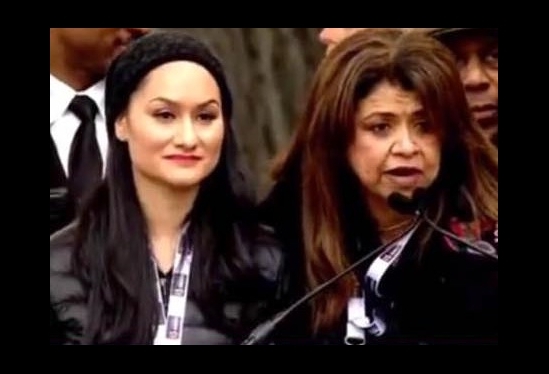 Carmen invited Aida to be a speaker at the March. A student recognizing the one teacher who cared. Our work matters, it is worth the pain; we make a difference in the academy. Our scholarship makes a difference. 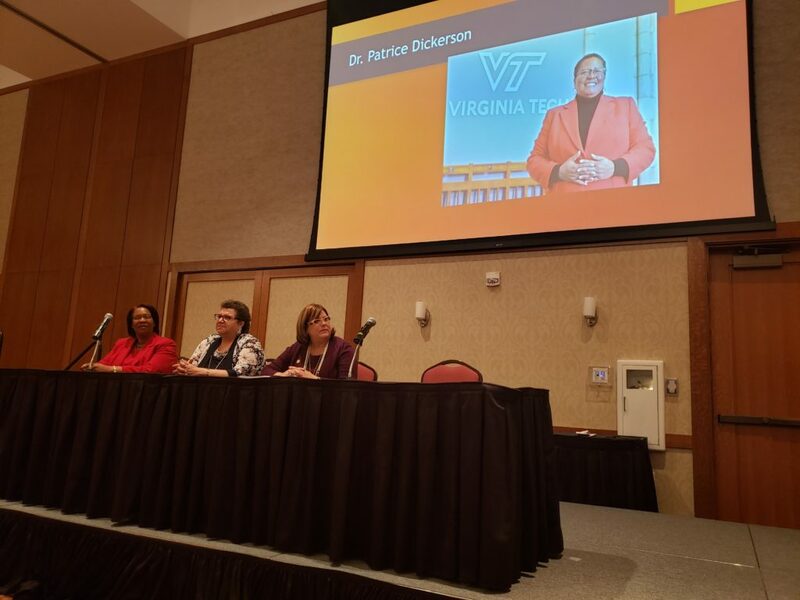 The president’s panel of women of color leaders, moderated by Dr. Patrice Dickerson, Director of Faculty Diversity at Virginia Tech, reminded us that “women don’t have to check every box.” Again, challenging the height of the bar — either that we set for ourselves, or that is set by others. They encouraged us to have more boldness and less conformity. They reminded us that when our time comes, we have to say yes, and allow our vision, passion, and commitment to lead the way.” They told us, “We can do it.” If we want to see change, we have to “sit at the table.” And that we must always have “big bold dreams.” From Nashville State Community College, to Sitting Bull College for Native American students, to University of Puerto Rico – Mayaguez, these women are leading institution focused on access and opportunity for the most vulnerable young people in our society — students of color. 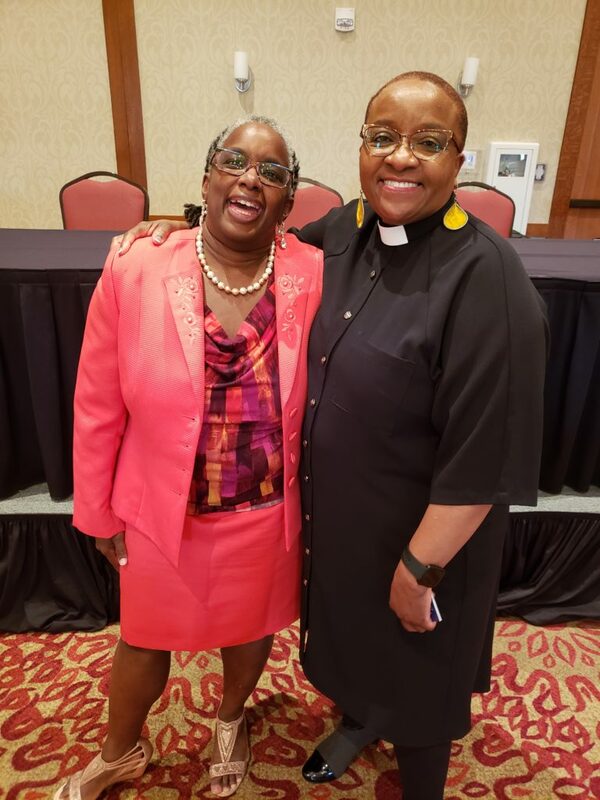 And Patrice, an phenomenal force on her own, as moderator reminded us that there are so few of us in these positions, and the wisdom and presence of those in these positions matters. 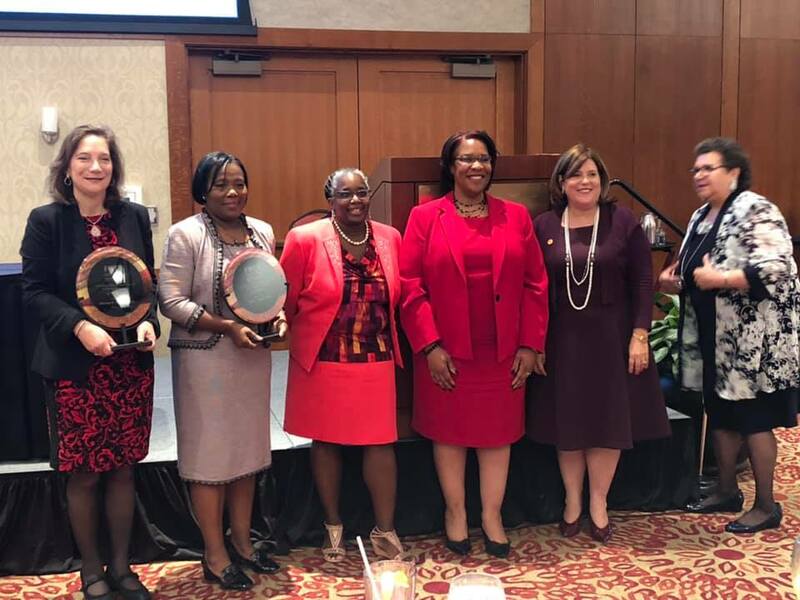 And our Zenobia Hikes award winners (an award in honor of an amazing African-American woman Vice President at Virginia Tech) – reminded us that we must recognize and celebrate the achievements and accomplishments of women of color. 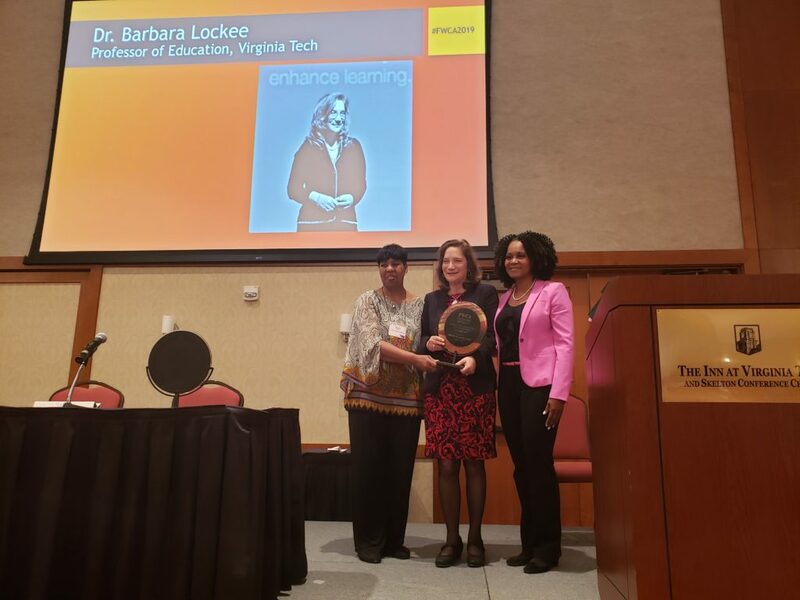 Dr. Barbara Lockee’s work and scholarship on language revitalization in Native American communities; her work as a faculty member; her work as a mentor of students; and her work as a champion of our tribal communities has been transformational. She is a powerful, calm, humble presence and force in the academy. 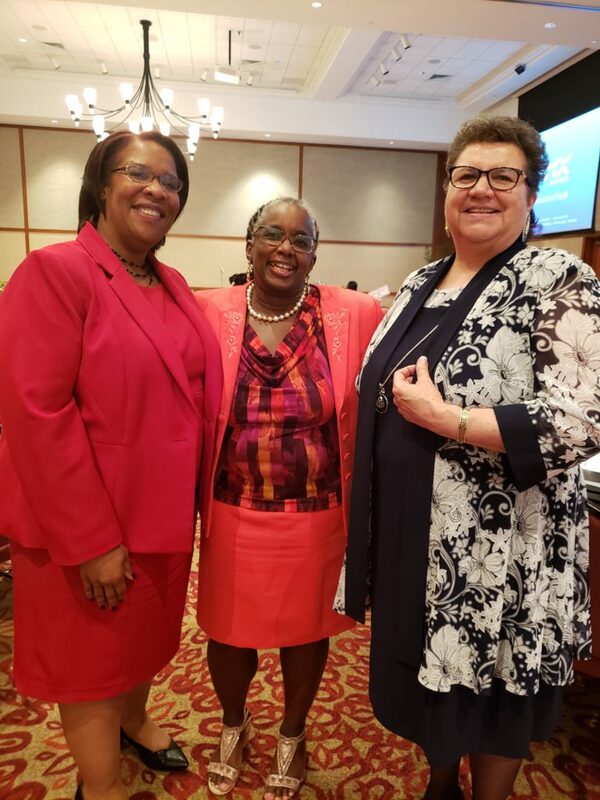 We also recognized were reminded of the power of one woman in the inspirational work of Provost Tracy Espy, of Pfeiffer University She used her power and position as Provost to address gender pay equity, promotion policies, and transform her institution for women and people of color. Many pictures were taken; new friends made; new connections at our own institutions and across institutions; in our state and across the United States. At FWCA, we invest in ourselves. 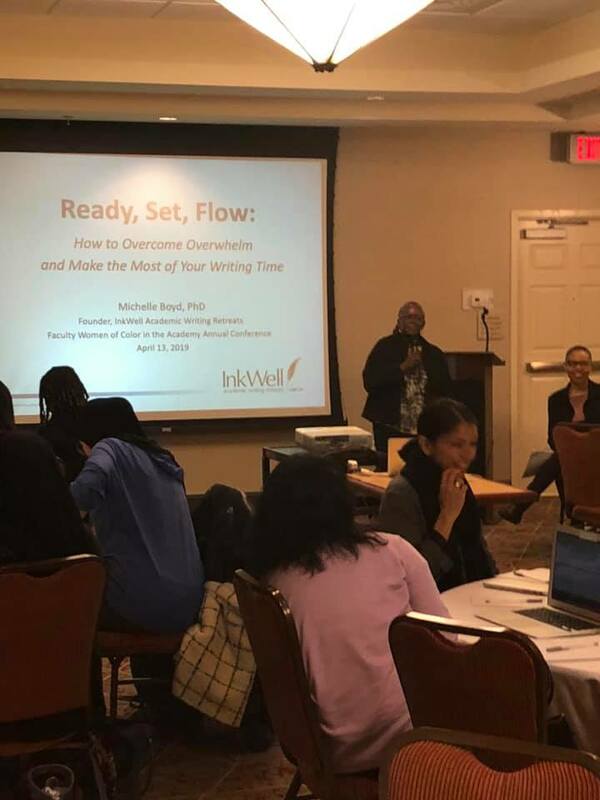 We learn the secrets from National Center for Faculty Development and Diversity founded by Kerry Ann Rockquemore and from Michele Boyd with Inkwell Writing Retreat. 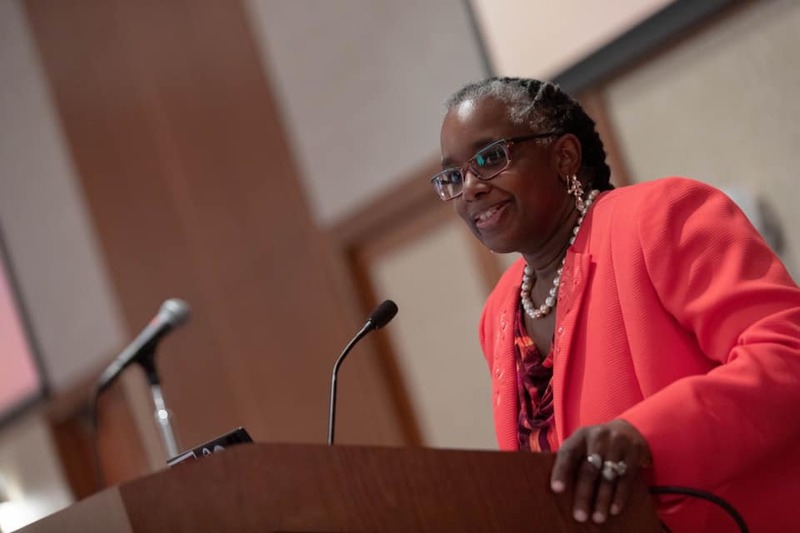 We have examples of courageous women who took risks to start something from nothing, but put their passion and gifts to work to assist hundreds and thousands of women of color in the academy. 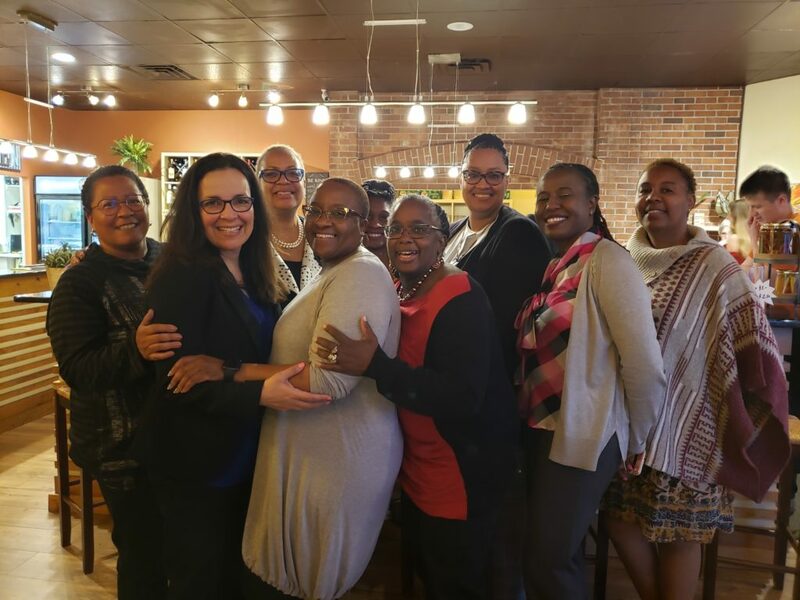 We learn from the many workshop leaders, who took time, knew they were doing a ministry, knew they were feeding those that needed to be fed; knew they were speaking to souls and spirits seeking affirmation, and spiritual food that sustains. We came to FWCA and we were fed, loved, affirmed, and sent back out to continue our good work. And, I, am grateful to each woman that came; to each institution that sponsored a woman or a group of women, letting them know that they are important and valued. I am grateful to the planning committee and the work of the team in the Office for Inclusion and Diversity. 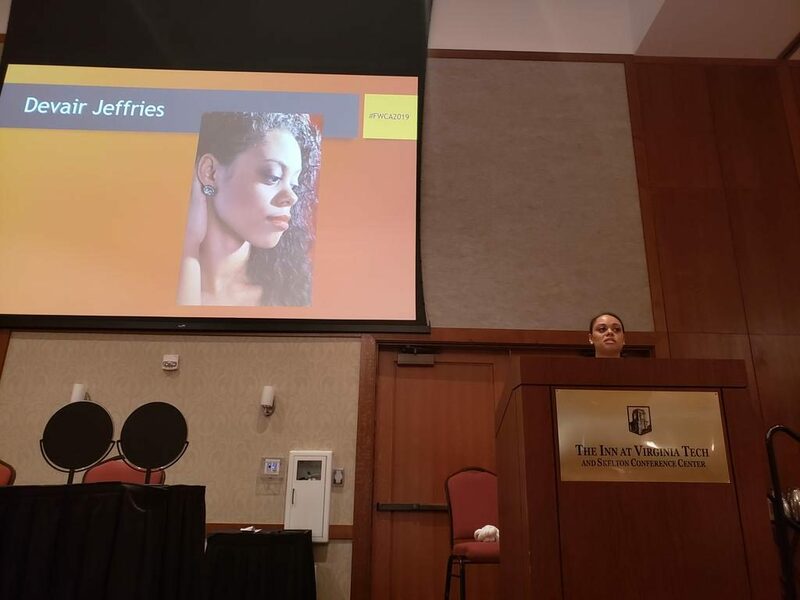 And most importantly, I am grateful to Virginia Tech, for sponsoring, hosting, and investing in women of color in the academy. 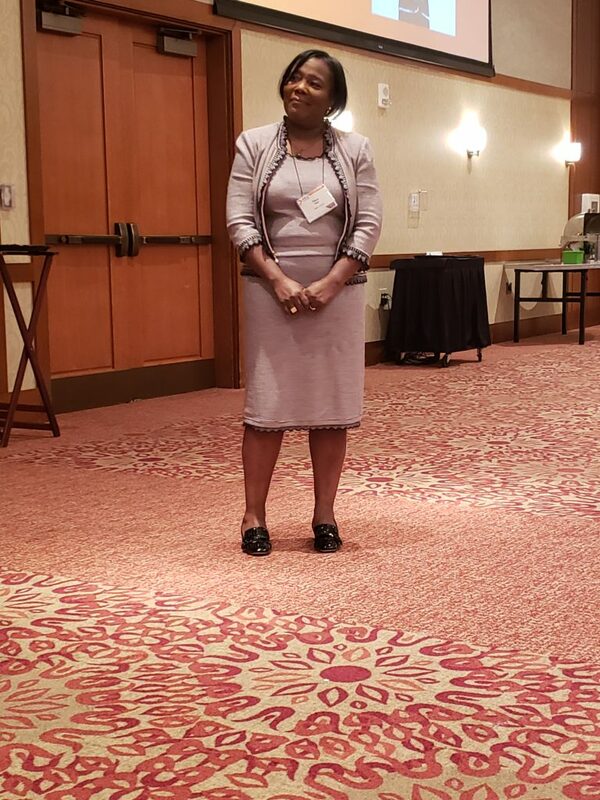 My amazing colleague, Michele Deramo, Assistant Provost for Diversity Education, has been an incredible conference coordinator, planner, and steward of this gift. 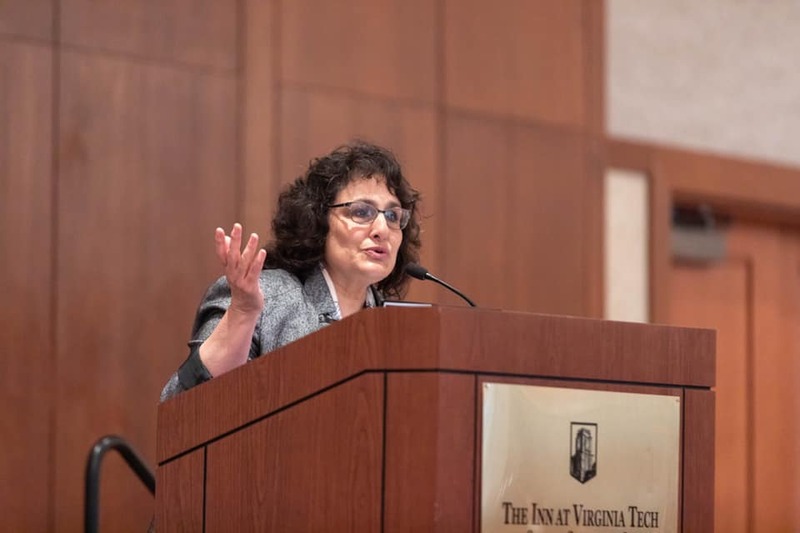 What is remarkable and often unacknowledged is that she is a White woman, who has dedicated her life to this difficult work of social justice, diversity, education, and engagement. 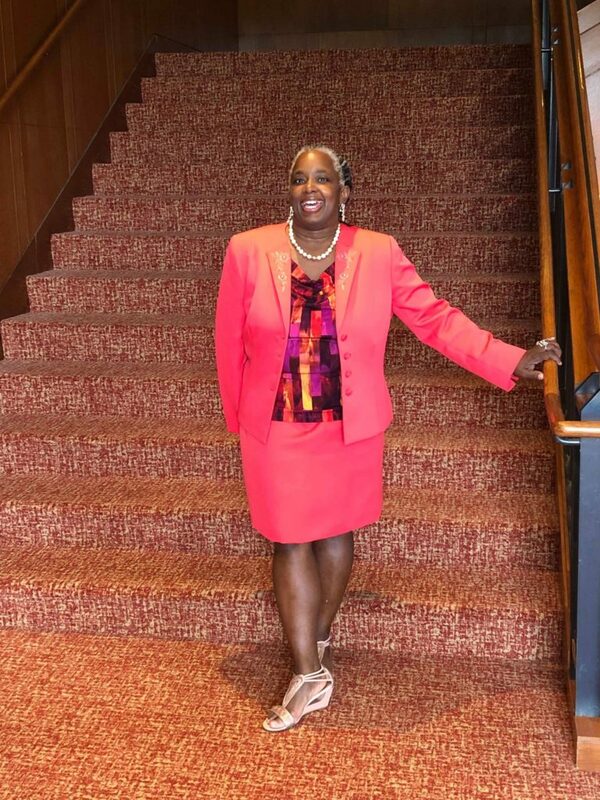 I’m grateful for her commitment, her tireless work, and cheerful and uplifting disposition, and her selfless dedication to a cause much greater to her. And, I, I can keep going, can keep pushing up the mountains, can keep climbing through valleys of the shadow of death, for the invisible presence and force of hundreds of women of color in the academy stand with, beside, and around me. Thank you. And, save the date, next year, our goal is 500 women of color, connecting, celebrating, and empowering one another. This was the best FWCA Conference ever. The team of professors I brought with me from Pfeiffer University loved every minute. They are already lobbying to return next year. I appreciated the the opportunity to present workshop and look forward to the stay in touch with new friends. Awesome job planning team! I leave this conference each year feeling renewed and reaffirmed. Everything is always perfect and love abounds among everyone the entire time. I’m so grateful for this space—Already looking forward to next year! !